This page is for the original release. For the remake, see King of Dragon Pass (2015). 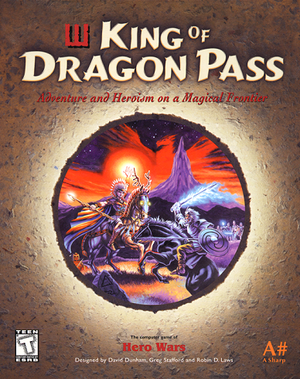 Bundled with King of Dragon Pass (2015). A demo is available for Windows and Mac OS. The Version 1.7 patch updates the retail version. The GOG.com version is already patched. On resolutions above 640x480 the game area is windowboxed. The game does not use vertical sync. Run KoDP.exe with the -w command line argument. This method actually launches mTropolis Windows Player in windowed mode. On higher resolutions game area will be still centered due to this reason. On/off only (individual toggles for Background, Adventure, Sound Effects). 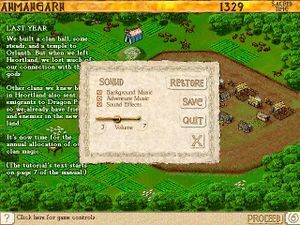 Mac OS version of the game also runs in classic mode on OS X. This page was last edited on 30 March 2019, at 06:55.